Wild radish are the number one problem weed in small grains in our area. 2,4-D is the cheapest herbicide to use, but often waiting until the small grain is fully tillered allows the radish time to grow to a point where they cannot be successfully controlled. Farmers like applying nitrogen and 2,4-D together in one trip across the field. Sometimes the nitrogen mixtures cause injury and applying 2,4-D early also causes injury and yield loss. 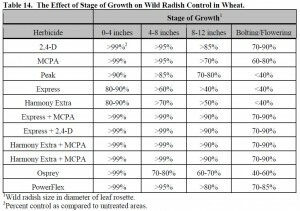 Dr. Stanley Culpepper discusses weed control options in detail in the Wheat Production Guide. 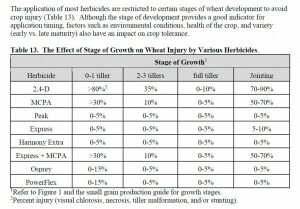 Let’s look at the wheat herbicide choices. 2,4-D controls several common winter broadleaf weeds such as buttercups, cornflower, cutleaf eveningprimrose, wild mustard, and wild radish. However, 2,4-D often does not adequately control chickweed and henbit. Mixtures with Harmony or Express are advised for these weeds. There are two formulations of 2,4-D, Ester and Amine. Ester or acid + ester formulations tend to be more effective under very cold conditions as compared to amine formulations. Additionally, ester and acid + ester formulations mix well with liquid nitrogen. Amine formulations can usually be mixed with liquid nitrogen, but the amine herbicide must first be premixed with water (one part herbicide to four parts water) and then the water-herbicide mixture added to the nitrogen with good agitation. Amines tend to cause less burn on the wheat than esters when nitrogen is used as the carrier. Amine formulations of 2,4-D are MUCH safer to use when sensitive plants are nearby; volatility of ester and acid + ester formulations of 2,4-D can be significant. Timing of application of 2,4-D is critical to avoid injury to wheat. The critical period for 2,4-D applications is after wheat is fully tillered but before jointing. Application before this growth stage may cause a “rat-tail” effect whereby the leaf does not form and unfurl properly. The crop may appear stunted and delayed in maturity, and tiller development may be adversely affected. Conversely, application after jointing has commenced may result in malformed seed heads. MCPA. Similar to 2,4-D, MCPA is a phenoxy herbicide that controls a broad spectrum of broadleaf weeds. Timing of application of MCPA is after wheat tillers (preferably 2+ tillers) but before jointing. 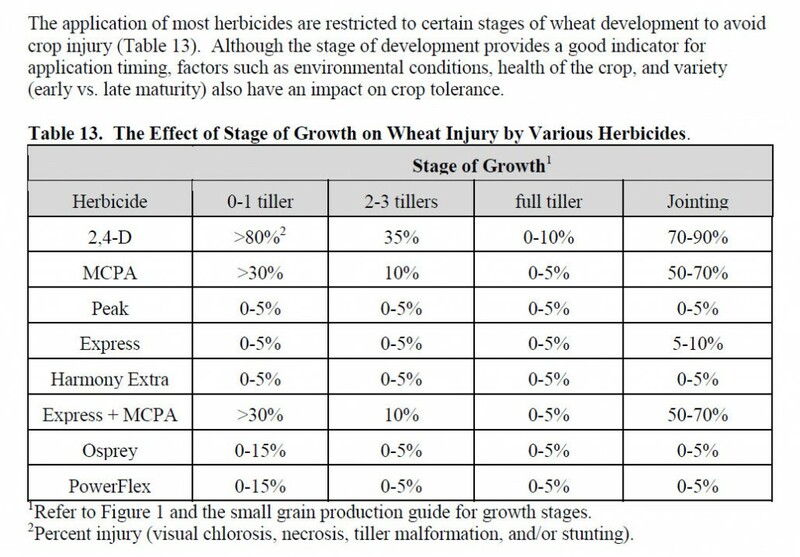 Injury, similar to 2,4-D injury, can be observed if applied before or after the critical period of application for wheat. In general, MCPA causes less injury to wheat than 2,4-D, but it is also less effective on larger weed species. MCPA and Express or Harmony tank mixtures are very effective on most Georgia broadleaf weeds. Harmony Extra. Harmony Extra is a prepackaged mixture of the sulfonylurea herbicides thifensulfuron-methyl and tribenuron-methyl. Harmony Extra can be applied in wheat after the two-leaf stage but before the flag leaf is visible. Application no later than the fully tillered stage is recommended for better spray coverage on weeds. Harmony Extra controls most of the common winter annual broadleaf weeds (Table 15). However, cornflower is a major exception. Wild radish must be small (less than two inch diameter) for adequate control by Harmony Extra. 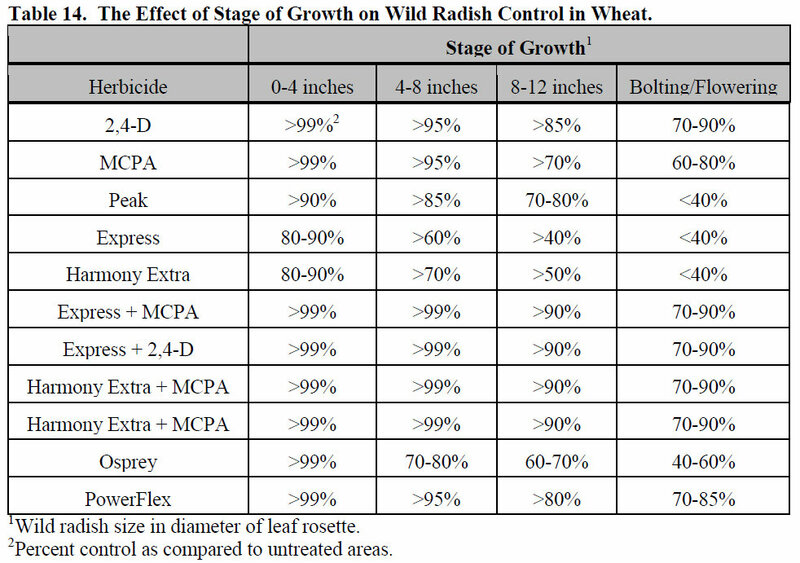 2,4-D or MCPA at 0.25 to 0.375 pound active ingredient per acre may be mixed with Harmony Extra for improved wild radish control and for control of cornflower; however, these mixtures must also follow the application restrictions of 2,4-D or MCPA. Harmony Extra is very effective on curly dock and wild garlic. A nonionic surfactant at the rate of 1 quart per 100 gallons of spray solution is recommended when Harmony Extra is applied in water. Harmony Extra also may be applied using liquid nitrogen as the carrier. In this case, premix the herbicide in water and add the mixture to the nitrogen with agitation. Adding surfactant when using nitrogen as a carrier will increase burn on the wheat foliage. Thus, when applying Harmony Extra in nitrogen, reduce the surfactant rate to 0.5 to 1.0 pint per 100 gallons of spray solution. For easy-to-control weeds, consider eliminating the surfactant when nitrogen is the carrier. However, do not eliminate surfactant when treating wild garlic or wild radish. Do not use surfactant when mixtures of Harmony Extra plus 2,4-D or MCPA are applied in nitrogen. An advantage of Harmony Extra compared to 2,4-D or MCPA is the wide window of application; however, tank mixtures of these compounds are encouraged. Express (tribenuron) and Peak (prosulfuron). Similar to Harmony Extra, Express and Peak are sulfonylurea herbicides that are effective on many winter annual broadleaf weeds (Table 15). Harmony Extra is superior to Express in controlling henbit, shepherd’s-purse, cutleaf eveningprimrose, and wild garlic. Peak is often the most effective option for controlling wild garlic but, a 10 month rotation restriction for soybeans, peanuts, and cotton exist for Peak at 0.75 oz of product per acre. Express can be applied after the wheat has two leaves but before the flag leaf is visible (Figure 1). Peak can be applied after wheat has reached the three-leaf stage but before the second detectable node of stem elongation. These herbicides also have an advantage over the phenoxy-type compounds such as 2,4-D because they can be used later in the season. Similar to Harmony Extra, Express may be tank mixed with 0.25 to 0.375 lb active ingredient of 2,4-D or MCPA for improved control of wild radish. Express may be slurried with water and then added to liquid nitrogen solutions. Use 1.0 qt of surfactant per 100 gallons of spray solution when applying express in water; use 1 pt of surfactant per 100 gallons when mixing with nitrogen, 2,4-D or MCPA; use ½ pt of surfactant per 100 gallons when mixing with nitrogen plus 2,4-D or MCPA. Posted in Weed control, Wheat. Bookmark the permalink.